"I try to make food approachable for everyone. The goal is to make people comfortable, to make people familiar with the unfamiliar"
"2018 James BEARD 'SINGLE SUBJECT' Cookbook NOMINATION"
I called it Cockscomb, after the prominent but underused part of the rooster. Cockscomb blends my adopted city’s diverse culinary influences, while paying homage to my background as a chef. I finally have an oyster bar resonant of my Newport days and a wood-fired oven that subtly smokes and fire-kisses our food. 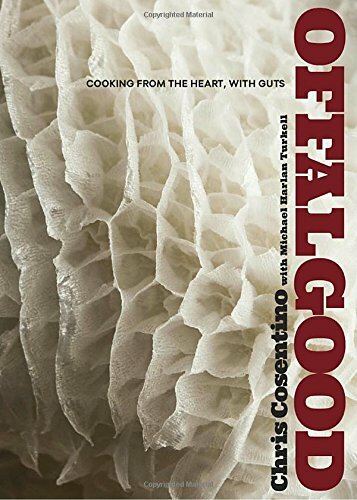 It’s a place where, among other things, I showcase offal as worthy of craftsmanship and creativity, as an American cook taking cues from my Italian and English heritage, all the while looking toward the future of cooking. Today I continue to experience the passion I felt as both a student and teacher in cooking school. I’ve taken all the lessons I’ve learned along the way, from my great-grandmother’s once-feared tripe, to Mark Miller’s incorporation of flavors from around the world, to Bob Kinkead’s strategy of combining the familiar with the unfamiliar, to the global travels that have inspired me, and I try to cook guts with both my brains and my balls. That’s what this book is about. It’s tradition and innovation, it’s honoring the animals we eat, it’s exploring the unique qualities of our ingredients, no matter how humble the bits."